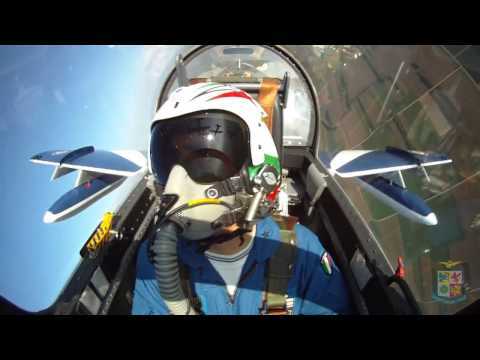 The Frecce Tricolori, whose full name is the National Aerobatic Team, which forms the 313º Acrobatic Training Group, is the aerobatic team (PAN), the Italian Air Force, created in 1961 following the decision of the Air Force to create a group Standing communal aerial acrobatics training of its pilots. With ten aircraft, including nine in training and one solo, are the most numerous aerobatic team in the world, and their flight program, comprising twenty stunts and lasting about half an hour, has made them the most famous. Since 1982 use as veivolo the Aermacchi MB.339 A / PAN MLU, and the seat is the airport of Looking (UD). Dal 1982 utilizzano come veivolo gli Aermacchi MB.339 A/PAN MLU, e la sede è l’aeroporto di Rivolto (UD).